This photo was taken in a Western Kentucky Amish settlement. Amish have an interesting relationship with tractors. And some Amish tractors are more interesting than others! Wheels go round and round. Whoo and they stop right here. I thought Amish tractors were horse drawn tractors? Marilyn mostly they are used for their engine power–say for filling up a silo, and not as a field machine. However a minority of Amish do use them in the field and even drive them around. To make them road-unfriendly they often require metal wheels rather than rubber, though looks like this fellow has both. I thought they were horse drawn tractors also. I lived in Stephenville Tx for 9 years, there use to be a bunch of Amish there. I have not been back since, are there still any there in that area? Perfect! My dad used to say that about our car. That’s what’s left of a Farmall M.
I’d bet it pulls left nasty. It’s about 70 years old, good for another 70. Steel wheels in the back is the answer for fields, but grouters (cleats) stop you from getting from field to field on the road. Since temptation is the reason for requiring steel wheels to prevent the use of a piece of farm equipment for recreational use or driving to town, this is the best solution to keep the state happy from destroying asphalt roads when you must get it down the road. That’s probably a Tar and Chip surface that doesn’t take well to steel at all. Police frown on rear steel wheels even crossing a road. Notice his grip on the steering wheel. I have driven something similar, and let me tell you, driving it was an aerobic activity! It’s probably a struggle to keep that tractor in the road. Good for another 100,000 miles! Also, the rubber tores have installed backward. Posted this pic to an antique tractor board for the humor value and got the explanation for this (from a guy who runs an Amish Taxi no less) — those old tires are covering steel wheels so he can move the tractor down the road. That’s why they’re on backwards, the left is falling apart, and the right one has two bolts through it (which I missed looking at it before). That’s right Matt this way of covering the wheels with rubber is actually pretty common in communities that can do it…I wouldn’t have recognized they are on backwards though–I wonder if there is a reason or it was just a goof-up here. You’ve actually got a few more bolts on both tires if you can discern in the photo. Hi Renee, the short answer is no–coincidentally we just had a post on the Stephenville Amish last week. It was an unusual Amish settlement. Sorry to be off topic Erik but here is a update on the beard cutting attacks from the AP for those that may be interested. Thanks Tom, I’ve been following that. Looks like their plea to get the hate crime charge thrown out was denied. A Trumbull County minister who is waging a campaign on behalf of 16 Amish men and women charged with federal hate crimes has accused U.S. marshals of intimidation for questioning him at his home about an earlier verbal confrontation with U.S. Attorney Steven Dettelbach. The steel cleats on the steel wheels are the correct direction pointing like arrows downward from the front. Adding rubber tires with lugs the oposite direction makes the thick rubber lug CROSS the steel cleat making it solid. Rubber lugs going the same direction doesn’t work since there are a different number of lugs to cleats. Some hit the cleats, others miss them and makes the tire out of round. This way a rubber lug always contacts a cleat inside. Without air, the tires don’t conform to the ground well, so are not as good in the field as aired tires, or steel that have larger cleats. Pads made from belting can be added between steel cleats to run on roads, but it makes it very smooth, and in sandy soil they dig right down with very little bite. 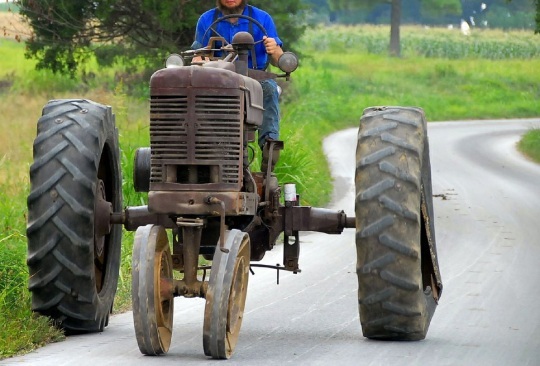 Adding rubber pads to steel wheels is for parade routes and show tractors, not field use. Adding a piece of steel like a lever or handle on the outside, (think garden hose winder) or sometimes an old steel rim is used to wrap a cable or chain around if you’re stuck and the wheel spins like a winch to pull you out. Holding the brake tight on the other side makes the side spin with the “winch”. Thanks for explaining this, Paul. Don’t let the surface rust on the skin fool you. If that old M has been maintained; crankcase oil changed regularly, antifreeze in the radiator, filters serviced when needed, etc it should be good for a bunch of years more. Especially if he is just using it for stationary power and a little bit of stealth transportation!